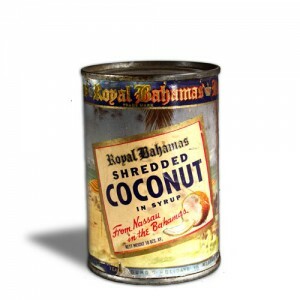 Dating from World War Two (1939-45), this unopened tin contains shredded coconut in syrup produced by Bahama Food Products Limited of Nassau (now a subsidiary of Nestlé). At a time when food rationing (which began in 1940) and shortages had removed “treats” from everyone’s diet (e.g. bananas did not become available again until 1945) it is likely that shredded coconut would have been a most welcome additional ingredient in cakes or biscuits.